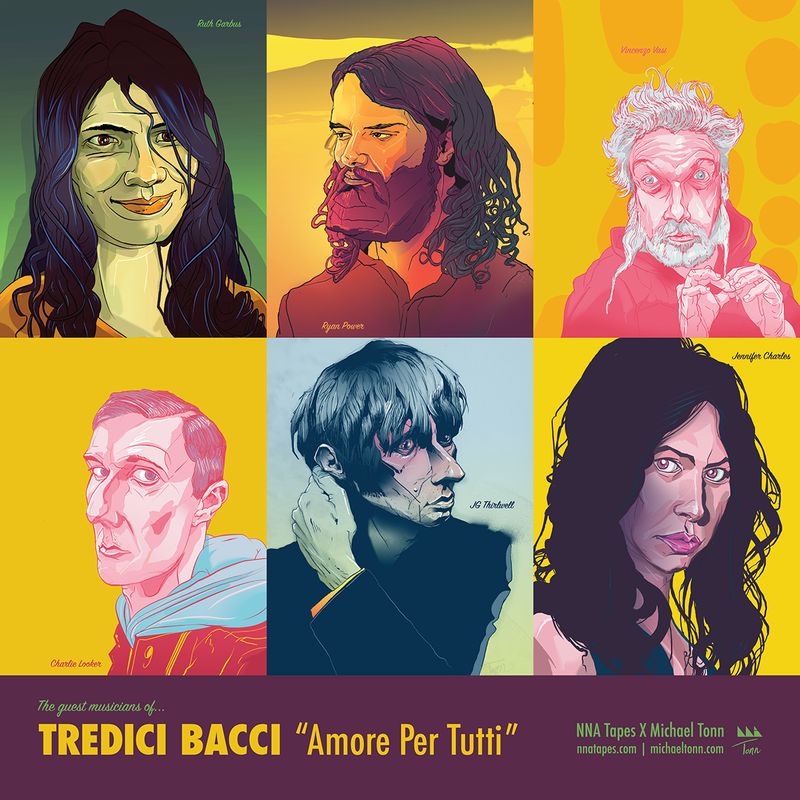 Music Playtime: Tredici Bacci ft. Ryan Power, "Modern Man"
The singers of 'Amore Per Tutti.' Ryan Power pictured middle, top row. Hello, weird wide web. Thanks for coming over to hang out with my disembodied voice for awhile. If you're new to this weekly transmission, the purpose is to relay my experience of local music. Today on my local radar, is the recently released track "Modern Man" from the album Amore Per Tutti by Tredici Bacci, featuring Ryan Power. Amore Per Tutti is available through NNA Tapes, the critically acclaimed independent label making waves out of Burlington since 2008. The album is an intersection of great international composers, brilliant classically-trained conservatory graduates of the Boston area and the underground voices of Vermont. Simon Hanes is the man behind the orchestration of this modern epic. Upon graduating from the New England Conservatory and ending his tenure as bassist in Guerilla Toss, Hanes conceived the creative alternate persona "Luxardo" and assembled the 14-piece Tredici Bacci as an ambitious endeavor in demonstrating visionary skill at orchestral arrangement. I encourage you to read the full description of the album on the NNA Tapes website, which fully unpacks the specific influences behind the album, as well as introduces some the collaborators involved. The unmistakable inspiration for the album includes Italian and French soundtrack composition from the 1960s and ’70s, spaghetti westerns, bossa nova and lounge acts — just to scratch the surface. Each track on the album is a masterpiece, but I would like to focus on "Modern Man," a song written and sung by Burlington's pop-mystic Ryan Power. "Modern Man" opens with an operatic female voice and a doo-wop swing. Power's voice enters with its signature sultry lounge croon and honest, confessional lyricism. Power has an innate talent for communicating the modern social struggle between sexes through romantic pop writing. Power sings, "Holy love has been forsaken / parents program / recalibration / freedom undermined / Check it out / you’re frustrated again / my friend/ Breaking out your turtle’s head / a coward’s defense / Don’t push me down / or block me out / We must embrace / all the fairies and the goblins face to face / How messed up is this man getting / he won’t receive the gifts we’re sending / Light shall pass through night." This line of thought might be interpreted as describing the non-romantic struggle feminists have with trying to love the archetype of a modern man. Each facet of Amore Per Tutti is loaded with intention, down to the nature of its physical release. In appealing to NNA's core demographic of serious collectors of physical media, the first 100 copies of the album are paired with a limited edition tape of Tredici Bacci and legendary experimental artist Gary Wilson live at WFMU studios in New York. The recording will not have a digital release, making it exclusive to early buyers of the LP. This one is for the true lovers.